Organize Me, Penelope! Organize Me Penelope! 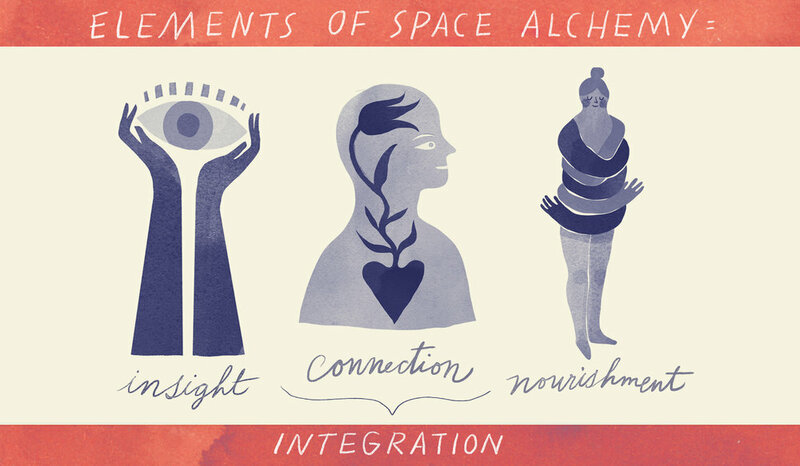 What is space alchemy/professional organizing/spatial intuition? Alchemy is defined as the ancient practice of turning lead into gold. It is a skillful action to see the gold in the lead. I see the gold when I walk into your space even if the lead is leading. I see the light in you even if it is being blocked or dimmed. Together we discover your power and vision then create the pathway forward to peace and possibility. Once you see that you too are an alchemist in your own life you will walk forward knowing you already have what you need to awaken to the light leading you from within. INSIGHT: As a Spatial Intuitive my first step into any space is checking in with my gut and creating awareness. Seeing your space for what it is and noticing what that feels like without any judgment. Then helping you to be in non judgmental contact and dialogue with your own inner compass as your guide. Your space will feel juicy because it will be created with intuition and mindfulness and will be filled up with the resonance of you. Using your gut to know what stays and what goes is the very first step which eventually becomes a FLOW zone moving you towards your goal. This is where we plant the seeds. CONNECTION: This is where we ground into Heart/Mind and connect to what is truly important to us. We further learn to cultivate the use of our intuition and it is from here that we make all our essential choices. When we live and act in alignment with our desires values and heart, our lives feel good and true and we can navigate choice much easier. There is a expansive boundless quality here, as though the windows of your house are open and only the freshest brightest spring air breezes through. This is where the seed starts getting some roots. NOURISHMENT: This is the phase of seeing organizing as self care. We need to transform this “chore” into a ritual. The goal is to create life balance and reveal the marrow of who we are. Self acceptance first, and then intentional self improvement can follow. We replace negative limiting beliefs and self talk with a kinder and more dynamic approach. This is where we continue to water the seed and the seed gathers the nutrients and minerals from the soil. INTEGRATION: This is the place where all the energetic work we have done takes form as skillful acknowledgement and action. Resulting in a beautiful space for you to reside in and greater harmony within yourself. We will create pathways to follow so that you can maintain your sacred space/life and continue to thrive and grow. This is where the seed sprouts into a blossom. Organization - for your office, home, home-office, files and general work-life strategies. I work with people who just need a kick start into creating systems as well people who are chronically disorganized and also people who hoard. Designing/Decorating -rooms in your home. Using objects and artifacts already in your home we will redesign your space. Shopping for just the right look or bringing in my own curated objects to style and mix in with what you already own. There are many ways to go and we will decide when we first meet up. Airbnb/Rental Styling-creating an inviting and warm space for your rental is key to get the most return in your investment. People come for the experience and cozy feel of your place as well as the location. Coaching - set realistic goals, receive assistance through accountability, and gain momentum in your target areas of life! Speaking Engagements- for your group or circle of friends who want more space alchemy tips and tricks. Organize Me Penelope! is a licensed and insured business. ©Organize Me Penelope! 2006. All Rights Reserved.